The reunited Guns N’ Roses kicked off their Not in This Lifetime tour at Los Angeles’ Troubadour last night. 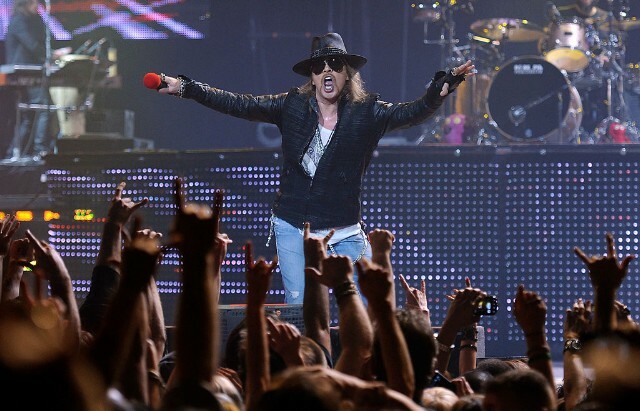 It was the first time original members Axl Rose, Slash, and Duff McKagan have performed together since 1993. In addition to a headlining slot at Coachella 2016, the band announced a full slate of U.S. tour dates yesterday. Cameras were not permitted into the April Fool’s gig, but enterprising fans managed to get a few shots anyway. YouTube user Rossthebassist compiled several of the best Instagram clips into a compilation video, which you can watch below (h/t Rolling Stone). Scroll down for more photos from the show, the setlist, a commemorative ticket, and more.